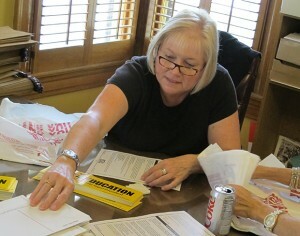 TOP: Retired teacher Jill Lyday assembles a "campaign in a box" at Glenda Ritz's headquarters in September. 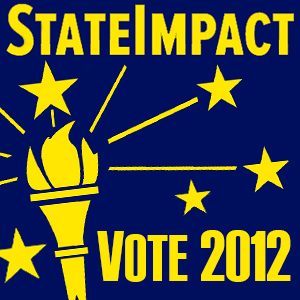 BOTTOM: We mapped out everyone in Indiana who contributed enough to receive a "campaign in a box." Scroll down to check it out. Scroll down to take a look at our map. Glenda Ritz’s staffers called it the “campaign in a box” — an idea so simple, it doesn’t sound at first like a campaign strategy. Everyone who contributed $25 to the Democratic state superintendent-elect’s bid to unseat GOP incumbent Tony Bennett received a “campaign in a box”: a yard sign, five bumper stickers and campaign postcards with Ritz’s main talking points. Every contributor’s job was to distribute the materials and talk to others they knew about Ritz’s policies. 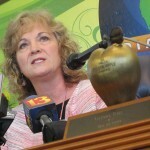 Bennett may have raised $1 million more than Ritz ultimately did, but Ritz’s contributions — many from teachers concerned over the direction of Indiana’s education policy — had a multiplier effect that fanned out across the state. This map shows all of the contributions from Indiana voters to Glenda Ritz’s campaign of $25 or more — the amount required for a donor to receive a Ritz “campaign in a box.” The blue dots represent individual contributors, the yellow dots show contributions from PAC’s or organizations. The above map shows contributions of $25 or more to the Ritz campaign. Each blue dot represents an individual donor, each yellow dot represents a contributing PAC or organization. Nearly half of Ritz’s campaign contributions came in the amount of $25. Nine out of 10 contributions to her campaign were $100 or less. Howey Politics Indiana reported Ritz made a $130,000 ad buy to run television spots in some of the state’s smaller broadcast markets. Larger contributions state or local chapters of teachers unions — which provided more than three-quarters of Ritz’s campaign funding — no doubt helped Ritz with bigger expenditures. Pastore says social media was also critical. She says, for some teachers, the frustrations teachers they on Facebook naturally progressed toward activism — and helped fuel Ritz’s campaign. Outgoing state superintendent Tony Bennett told reporters after conceding the race on Tuesday night he felt his opponent ran “a very effective ground game” with the assistance of the teachers unions. “I’m not here to vilify them — that’s their job. They had a candidate. They worked their tails off to get their candidate elected. More power to them,” Bennett said.